Martin was always calm, even when I wasn’t. As an especially nervous learner driver I was looking for an instructor who could help build confidence as well as teach me to drive. 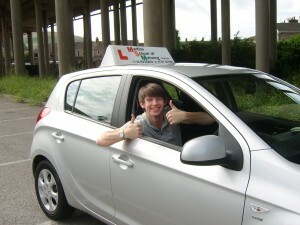 Martin is absolutely top drawer – you won’t find a better instructor in the area. Learning to drive should not be a chore; Martin made it a lot of fun for me and I’m pleased to say I’m now a fully-fledged driver. I spent 6 weeks on the semi-intensive course with Martin and I was extremely nervous to begin with, but straight away I was put at ease by Martin’s calm and sensitive manner, and was soon on my way to passing my test the first time! I’d recommend Martin to anybody, as he gives great direction in a calm manner to ensure maximum happiness whilst learning to drive.